TH E M R EP O RT | 17 COVER STORY throughout the lending ecosystem. "There are lots of reasons why we've seen so little innovation in the appraisal indus- try," Mohler said. 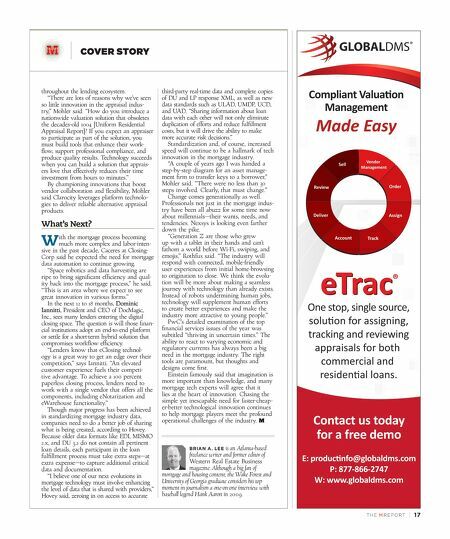 "How do you introduce a nationwide valuation solution that obsoletes the decades-old 1004 [Uniform Residential Appraisal Report]? If you expect an appraiser to participate as part of the solution, you must build tools that enhance their work- flow, support professional compliance, and produce quality results. Technology succeeds when you can build a solution that apprais- ers love that effectively reduces their time investment from hours to minutes." By championing innovations that boost vendor collaboration and flexibility, Mohler said Clarocity leverages platform technolo- gies to deliver reliable alternative appraisal products. What's Next? W ith the mortgage process becoming much more complex and labor-inten- sive in the past decade, Caceres at Closing- Corp said he expected the need for mortgage data automation to continue growing. "Space robotics and data harvesting are ripe to bring significant efficiency and qual- ity back into the mortgage process," he said. "This is an area where we expect to see great innovation in various forms." In the next 12 to 18 months, Dominic Iannitti, President and CEO of DocMagic, Inc., sees many lenders entering the digital closing space. The question is will those finan- cial institutions adopt an end-to-end platform or settle for a short-term hybrid solution that compromises workflow efficiency. 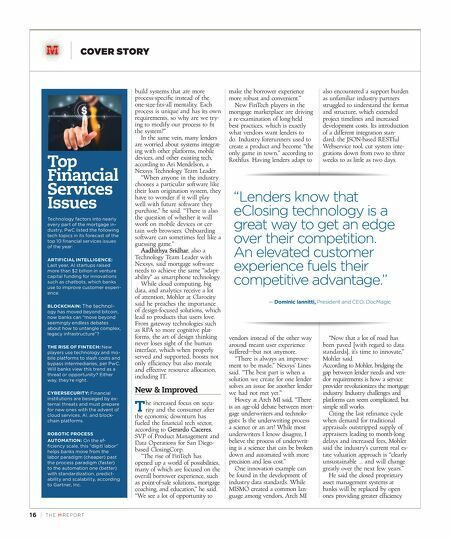 "Lenders know that eClosing technol- ogy is a great way to get an edge over their competition," says Iannitti. "An elevated customer experience fuels their competi- tive advantage. To achieve a 100 percent paperless closing process, lenders need to work with a single vendor that offers all the components, including eNotarization and eWarehouse functionality." Though major progress has been achieved in standardizing mortgage industry data, companies need to do a better job of sharing what is being created, according to Hovey. Because older data formats like EDI, MISMO 2.x, and DU 3.2 do not contain all pertinent loan details, each participant in the loan fulfillment process must take extra steps—at extra expense—to capture additional critical data and documentation. "I believe one of our next evolutions in mortgage technology must involve enhancing the level of data that is shared with providers," Hovey said, zeroing in on access to accurate third-party real-time data and complete copies of DU and LP response XML, as well as new data standards such as ULAD, UMDP, UCD, and UAD. "Sharing information about loan data with each other will not only eliminate duplication of efforts and reduce fulfillment costs, but it will drive the ability to make more accurate risk decisions." Standardization and, of course, increased speed will continue to be a hallmark of tech innovation in the mortgage industry. "A couple of years ago I was handed a step-by-step diagram for an asset manage - ment firm to transfer keys to a borrower," Mohler said. "There were no less than 30 steps involved. Clearly, that must change." Change comes generationally as well. Professionals not just in the mortgage indus - try have been all abuzz for some time now about millennials—their wants, needs, and tendencies. Nexsys is looking even farther down the pike. "Generation Z are those who grew up with a tablet in their hands and can't fathom a world before Wi-Fi, swiping, and emojis," Rothfus said. "The industry will respond with connected, mobile-friendly user experiences from initial home-browsing to origination to close. We think the evolu - tion will be more about making a seamless journey with technology than already exists. Instead of robots undermining human jobs, technology will supplement human efforts to create better experiences and make the industry more attractive to young people." PwC's detailed examination of the top financial services issues of the year was subtitled "thriving in uncertain times." The ability to react to varying economic and regulatory currents has always been a big need in the mortgage industry. The right tools are paramount, but thoughts and designs come first. Einstein famously said that imagination is more important than knowledge, and many mortgage tech experts will agree that it lies at the heart of innovation. Chasing the simple yet inescapable need for faster-cheap - er-better technological innovation continues to help mortgage players meet the profound operational challenges of the industry. BRIAN A. LEE is an Atlanta-based freelance writer and former editor of Western Real Estate Business magazine. Although a big fan of mortgage and housing content, the Wake Forest and University of Georgia graduate considers his top moment in journalism a one-on-one interview with baseball legend Hank Aaron in 2009.